This entry was posted on Tuesday, March 1st, 2011 at 09:34and is filed under . You can follow any responses to this entry through the RSS 2.0 feed. You can leave a response, or trackback from your own site. I have a free trial code for the first comment on this thread. I’m looking forward to try it. Hi Gianluca, I just sent you a trial code. Very nice! I just downloaded it. Thanks for the heads up. I’ve just downloaded it and had a little play in the office. Looks very intuitive, can’t wait to see what people manage to create on it. Great. I’m curious. Hope to Download it sooooooon! I’m soooooo excited, that I just can’t hide it!!! So glad we now have the UNITED fingerpainters flickr group to post in too. Yay Steve Yay fingerpainters. Just downloaded it and did some initial playing around. I second what Dex said above — I’ve tried out most of the vector apps and certainly in combining the most important features with ease of use and performance, inkpad comes out in top. The pen (bezier) tool, in particular, is one that seems to be a pain point in a lot of other apps, but works great in inkpad. Intaglio Sketchpad is also quite good, and a little more feature rich — for example, you can auto-generate uniform polygons (e.g. a hexagon), stars and even complex spirograph-like patterns. I think at least simple uniform polygons might be a good future addition for inkpad, but the other stuff is very specialized and not a must for most users. Sketchpad is also relatively pricy — 14.99. Not sure what inkpad’s price will ultimately be, but at the intro price of $1.99 it is definitely an incredible steal! I’m kind of wondering if the release of Inkpad the day before the iPad 2 announcement is more than just a coincidence? Maybe there are some additional iPad2-only features in the app? 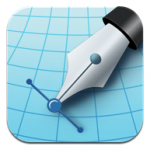 Is there a freestyle pen, like Adobe Ideas? Is there an eraser? 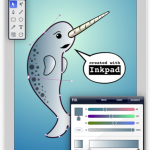 Also, I must say the narwhal is brilliant! Check back here tomorrow. More Inkpad codes to give away! Very nice app, going to go and have a play now. Thanks for the heads up. Free inkpad code for the next person to write INKPAD in one of the comments below!!! INKPAD need to try this out! Hi ufogeek, just sent it off to you! Let us know here at fingerpainted.it what you think. Just downloaded ink pad app at the same time as brushes app. Is there a support document available for ink pad as there is for brushes? No sorry, not from us. that offer expired. I can only say that the cost of the app is extremely reasonable and well worth the price.